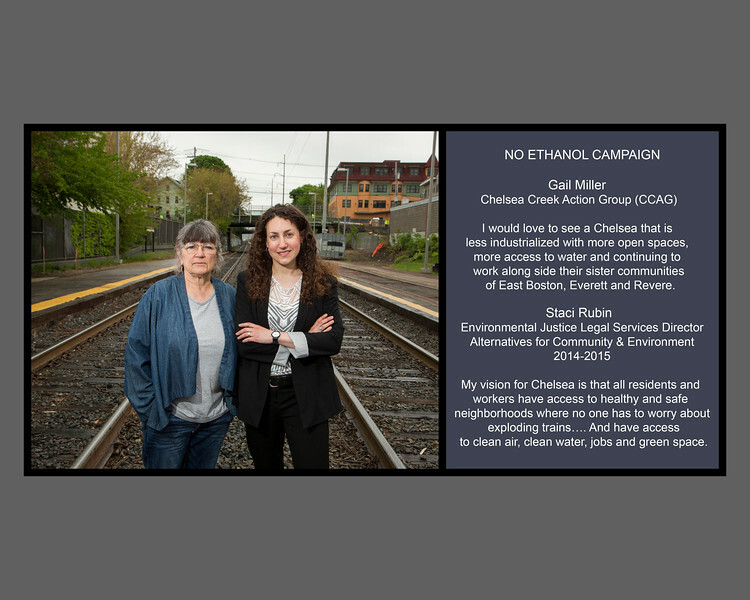 GreenRoots led a multi-city campaign to stop Global Oil’s proposal to bring between 100 -150 ethanol trains annually to its facility along the Chelsea Creek in Revere. These freight trains would have transported 281-468 million gallons of highly flammable and volatile ethanol through very densely populated neighborhoods, in many instances, right next to homes. The company was looking to increase its volume of ethanol, which had been transported via barge or ship, to the detriment of dozens of communities including Chelsea, Boston, Cambridge, Revere and Somerville. Community members requested that Global withdraw its proposal from consideration. 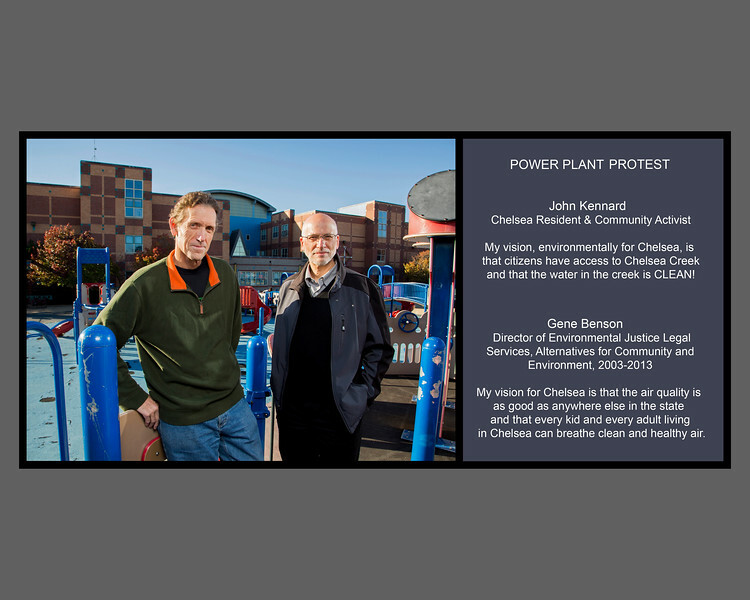 When it wouldn’t, GreenRoots, together with partners, The Chelsea Creek Action Group (CCAG) and Alternatives for Community and Environment (ACE), devised strong legal strategies that resulted in passage by the state legislature and the governor of a moratorium on the transportation of ethanol via freight train to the Chelsea Creek and through adjacent communities. Global Oil, once again, participates in the Chelsea Creek Business Roundtable which promotes greater communication between the community and the industries co-existing on the Creek. 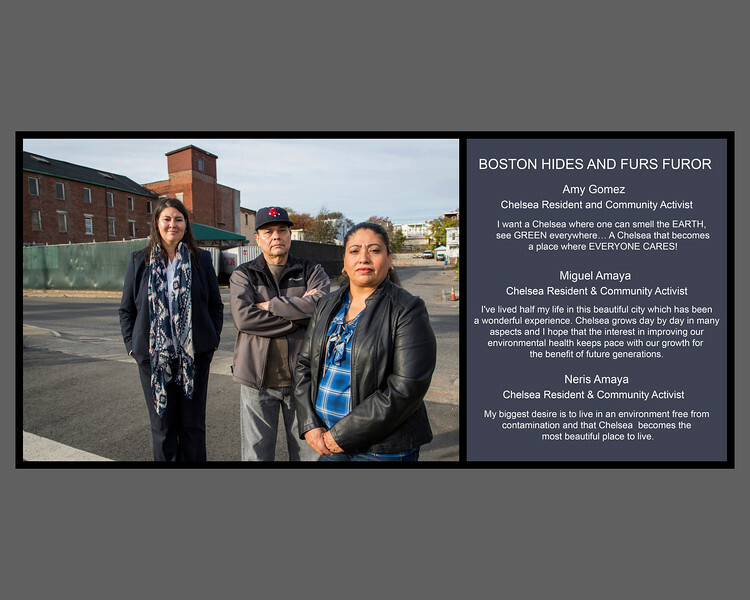 GreenRoots works collaboratively with the Neighborhood of Affordable Housing (NOAH) as part of the Chelsea Creek Action Group (CCAG). 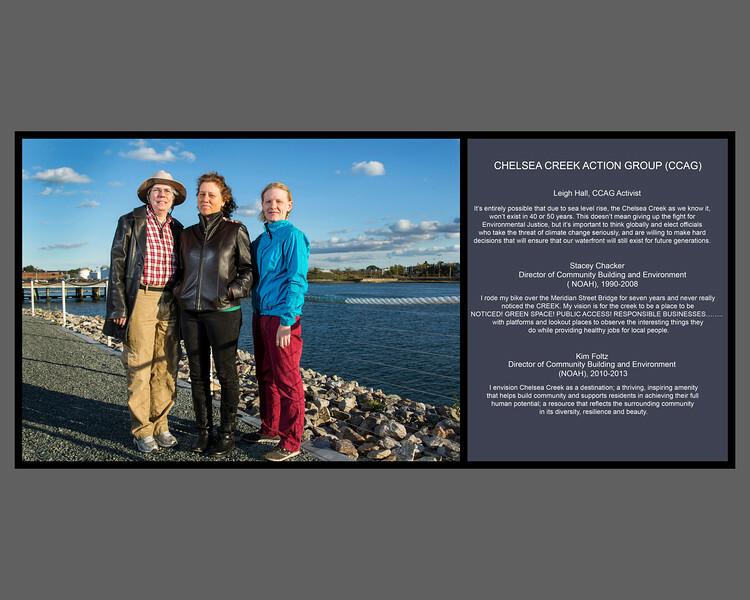 CCAG is a coalition of Chelsea, East Boston and Revere residents convened by GreenRoots and NOAH to implement numerous cross-Creek projects so that the Chelsea Creek waterfront is looked at holistically and not simply from one side of the river. 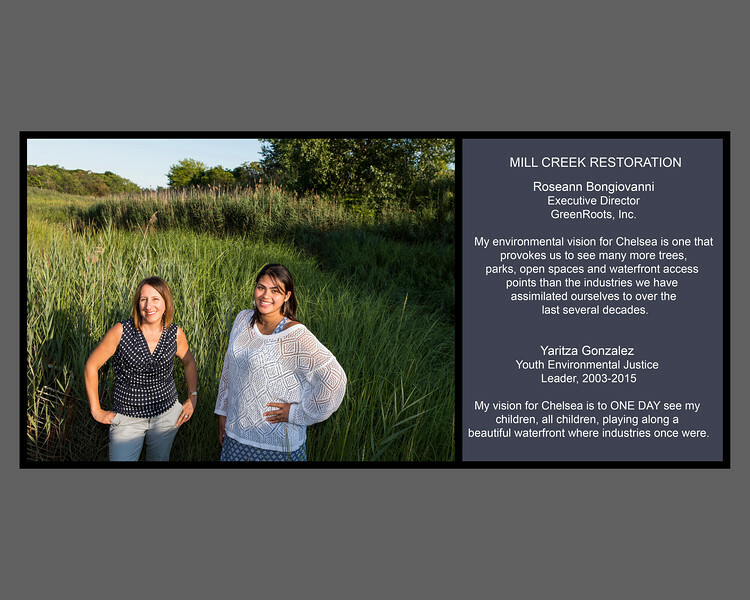 This cross-Creek partnership has developed some fruitful projects including the Chelsea Creek Community Vision Plan; the Chelsea Creek Comparative Risk Assessment; the successful Chelsea River Revel 5K Race and Festival which closed the Meridian Street Bridge to vehicular traffic to allow for this community festival; local advocacy to direct funds to local environmental trusts and foundations from damage settlements of companies responsible for oil spills; and campaigns to develop waterfront parks, as well as expanding youth engagement in environmental justice issues. CCAG continues to coordinate and facilitate the Chelsea Creek Business Roundtable which meets quarterly and provides an opportunity for improved communication between the community and its industrial neighbors. (CAD) Cells are specially engineered holes dug into the bottom of the harbor floor for the purposes of “storing” contaminated sediment. Because most big harbors are littered with cancer-causing chemicals known as PCBs, the sediment dug up to allow vessels into the harbor can not just be placed anywhere. So CAD CELLS were created to contain dredged material unsuitable for unconfined open water disposal. Boston Harbor’s “dredge material management plan” placed 9 of the last 11 CAD cells that have been constructed, beneath the navigation channel in the Mystic and Chelsea Rivers and the Inner Confluence as part of the Boston Harbor Navigation Improvement Project (BHNIP). The BHNIP marked the first major use of CAD CELLS in the U.S. The Chelsea River Cell remains the last open CAD Cell in the harbor. 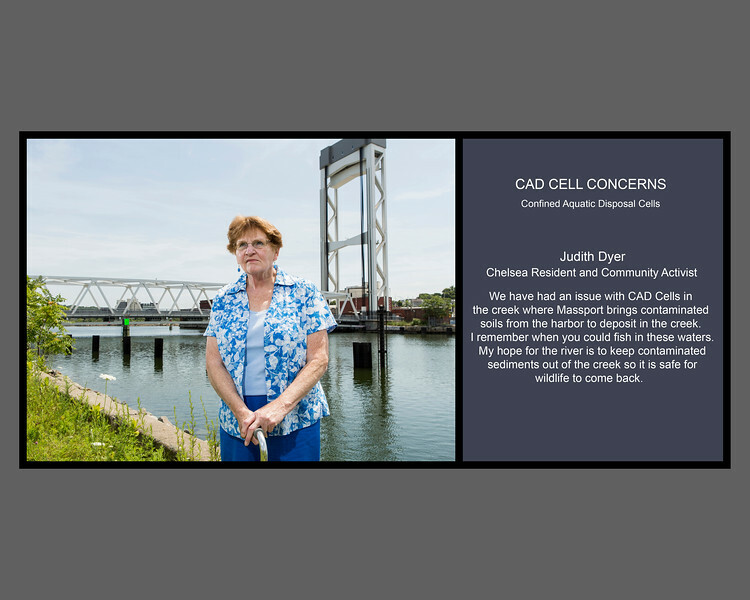 In the spring of 2015, as a result of community concerns, the Chelsea Conservation Commission denied Massport’s application to deposit contaminated sediment into the last remaining open CAD CELL in the Chelsea Creek. As a result of further testing, this sediment was found to be more toxic than originally thought and was removed by Massport to a land facility at a cost of approximately $2 million. 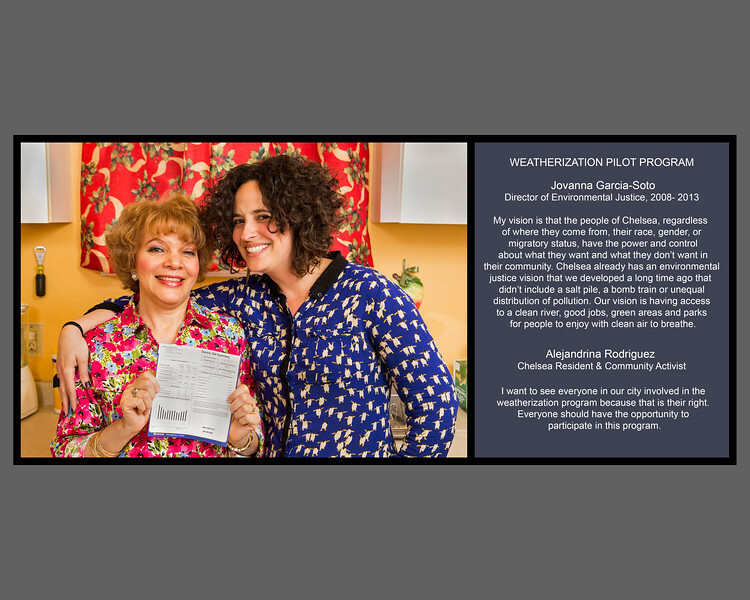 WEATHERIZATION PILOT PROGRAM Through the leadership of GreenRoots, a member of the Green Justice Coalition (GJC) which is coordinated by Community Labor United, Chelsea was chosen as one of five pilot communities for massive weatherization and energy efficiency work. Community organizing worked toward the goals of the project: to increase the number of participants earning 60-120% of the median household income to weatherize their homes; and to help small businesses undergo an energy efficiency retrofit. Typically, low-to moderate-income households do not know about or participate in these programs, though they pay for them through monthly energy efficiency charges on their utility bills. By weatherizing homes, this project benefitted Chelsea by saving homeowners’ and renters’ money while improving the environment. This program also offered green jobs with good pay to Chelsea folks, especially young adults. GreenRoots successfully implemented energy efficiency measures for 112 Chelsea homes. The energy efficiency measures included insulation, air sealing, electrical and lighting upgrades, energy efficient light bulbs and thermostats — all providing monthly savings on utility bills. In the end, GreenRoots exceeded the goals set forth at the beginning of the project. Through the leadership of GreenRoots, a member of the Green Justice Coalition (GJC) which is coordinated by Community Labor United, Chelsea was chosen as one of five pilot communities for massive weatherization and energy efficiency work. Community organizing worked toward the goals of the project: to increase the number of participants earning 60-120% of the median household income to weatherize their homes; and to help small businesses undergo an energy efficiency retrofit. Typically, low-to moderate-income households do not know about or participate in these programs, though they pay for them through monthly energy efficiency charges on their utility bills. By weatherizing homes, this project benefitted Chelsea by saving homeowners’ and renters’ money while improving the environment. This program also offered green jobs with good pay to Chelsea folks, especially young adults. GreenRoots successfully implemented energy efficiency measures for 112 Chelsea homes. The energy efficiency measures included insulation, air sealing, electrical and lighting upgrades, energy efficient light bulbs and thermostats — all providing monthly savings on utility bills. In the end, GreenRoots exceeded the goals set forth at the beginning of the project. Mary O’Malley Park is the largest waterfront park, and for many years, was the only waterfront park in Chelsea. It is owned by the State’s Department of Conservation and Recreation. 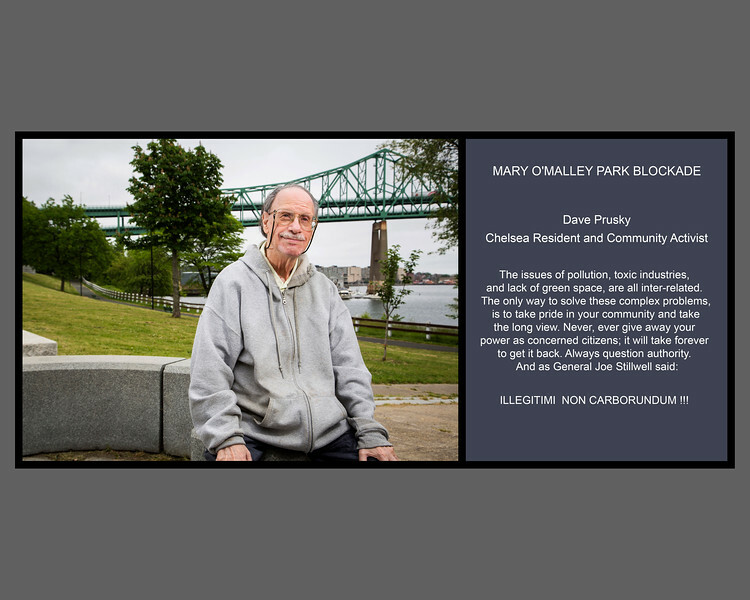 Mary O’Malley Park is located in the most affluent and least diverse neighborhood in Chelsea. In 1997, a small group of neighborhood residents requested the State to take measures to stop community residents from playing soccer there. Subsequently, the State placed jersey barriers and boulders throughout the park that prevented ball playing and made it look like a construction site. GreenRoots saw this as an injustice as the park is owned by all taxpayers -- not just the affluent-- and the soccer players were low-income people of color who simply longed for a place to play. The only other large park, at the time, was undergoing construction for the new schools. GreenRoots organized the community, including soccer players and Admiral’s Hill residents, who opposed the barriers; and in a short time, won the commitment of the state to remove the barriers. The State spent over $120,000 to place and remove the barriers. 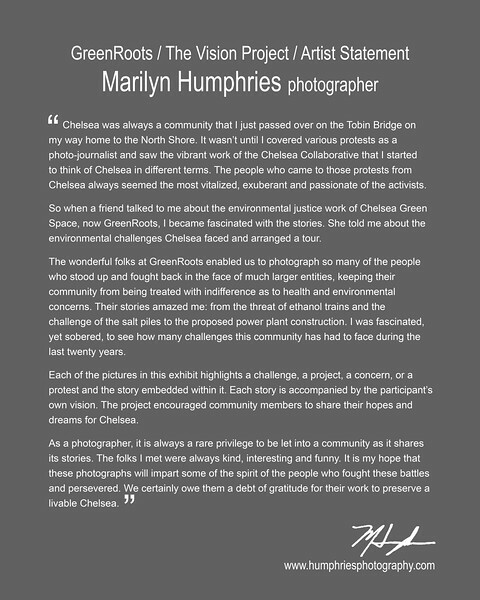 Through this campaign came some of GreenRoots’ longest and most dedicated members who wanted to see the park utilized by people of all backgrounds. 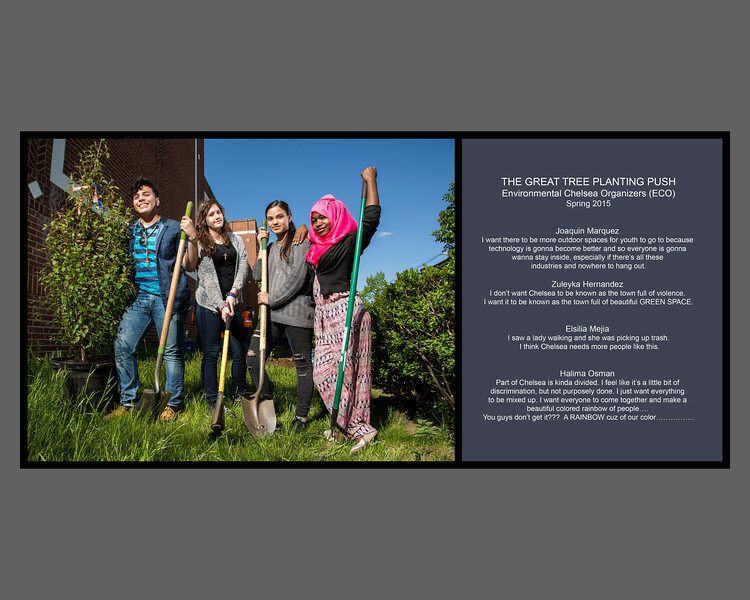 The Environmental Chelsea Organizers (ECO) worked in collaboration with the City of Chelsea and the Massachusetts Department of Conservation and Recreation to plant over 2,000 trees in the city, both on private and public properties. ECO youth members were instrumental in developing outreach materials as well as knocking on hundreds of doors in order to motivate residents to take advantage of this free program. They spoke to residents in Spanish and English and shared the many benefits that trees bring to an urban setting including: beautification, energy conservation during both the summer months and winter months, improved mental health and reduction of noise pollution. At the end of the season, homeowners who received a free tree were also eligible to receive a free rain barrel to help collect rain water for their trees. We hope to replicate this amazing program in the years to come! The plot of land on Hawthorne Street was once an abandoned lot used for illegal dumping. 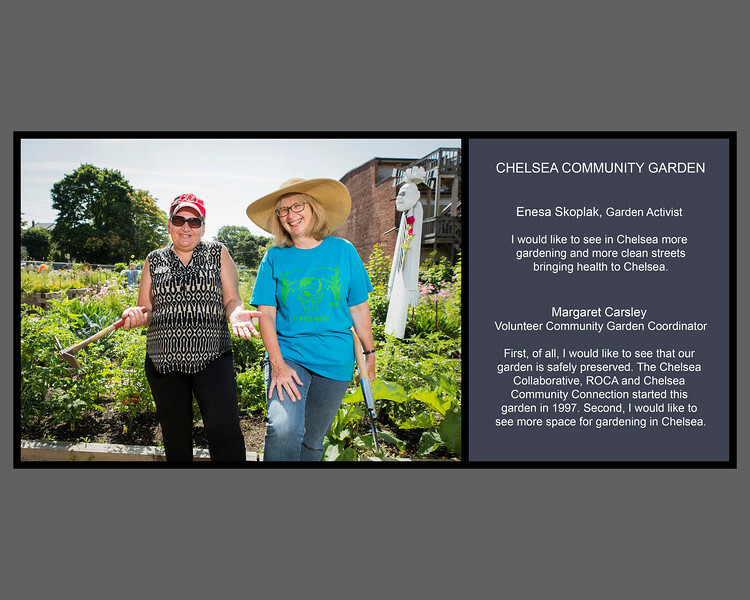 Green Space, now GreenRoots, gained access to the land and is currently using it as a community garden for more than 20 Chelsea families. In all, GreenRoots has three gardens to tend. The second garden is at Temple Emmanuel and is dedicated to the Somali Bantu refugee population. The third is part of the KaBOOM! Park and is dedicated for the Chelsea youth. 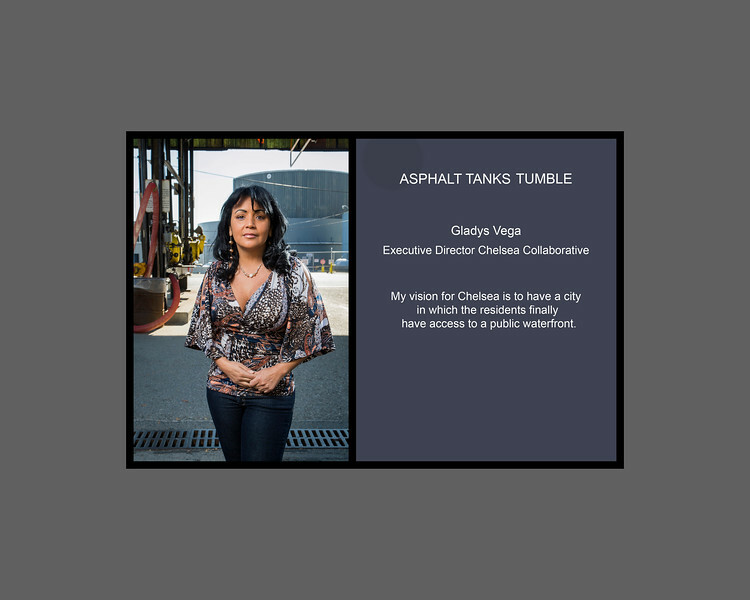 In 1997, the “Chelsea Sandwich” oil terminal owned by Global Oil and located in Chelsea’s waterfront neighborhood proposed to bring asphalt to its facilities. Neighbors, some of whom lived as close as 50 feet from the facility, were deeply concerned about the cancer-causing agents found in asphalt and the sheer nuisance of the product. GreenRoots organized the neighborhood and began protesting, picketing and marching to stop the conversion of oil tanks to asphalt storage tanks. GreenRoots was successful in getting the Board of Health to name the company a “public nuisance” and got Toxics Action Center to name the company one of their Dirty Dozen Award Winners. Ultimately, GreenRoots successfully advocated for the state legislature to pass, and the acting governor to sign, a bill banning asphalt in Chelsea. Since then, Global Oil has implemented many upgrades and improvements to their facilities to make it less of a nuisance to the adjacent neighborhood, and the company participates in the Chelsea Creek Business Roundtable which promotes greater communication between the community and the industries co-existing on the Creek. GreenRoots has completed two phases of salt march restoration that entails removing invasive species, increasing salt water flow further up the creek, removing sediment from the banks of the Creek and improving corridors to create a greater sense of connection from the Creekside Commons Park and the Mill Creek walkway to Mill Creek. We are currently undertaking phase three of this project. Boston Hides and Furs preserves cow hides so they can be turned into leather products. They are preserved in Chelsea and transported all over the world. Due to the sheer number of animal hides treated, a horrendous odor persisted, even blocks from the factory. GreenRoots helped nearby residents organize to get the company named a public nuisance by the Board of Health and named as a Toxic Action Center 2001 “Dirty Dozen” award winner. To address the Board of Health and residents’ concerns, the company agreed to a legal consent decree that outlined measures the company had to implement to address odor, rodent/pest, and sanitation issues. These measures cost the company over $200K and finally won some quality of life for neighboring residents. Though the company operates cleaner now, the community continues to watchdog its activities to ensure that the company is meeting the requirements of the consent decree. GreenRoots, through grassroots organizing, successfully thwarted the efforts of Energy Management Inc. which was proposing clean, renewable energy through the Cape Wind Project, while proposing a dirty diesel power plant to be constructed on the banks of the Chelsea Creek and directly across from Chelsea’s elementary school complex housing every public school student in grades 1-4. GreenRoots mounted widespread opposition and used every tactic to defeat the proposal, from protests to letter writing campaigns to media strategies, until the proponents withdrew their proposal from the state’s approval. This was a huge victory for the community! It was a perfect example of how a community united will never be defeated! 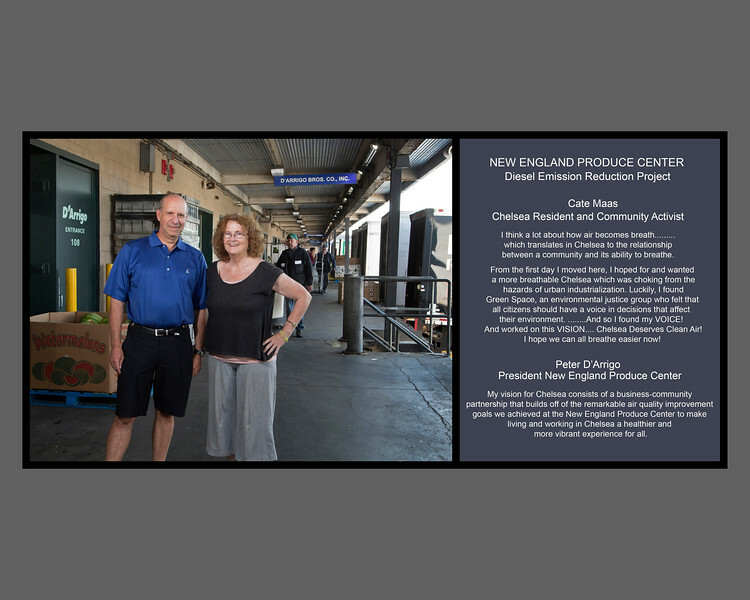 The New England Produce Center (NEPC) is the second largest produce distribution center in the nation. It’s a cooperative of 35 companies selling fruit and vegetables throughout New England, some mid-Atlantic states and parts of southern Canada. NEPC averages 37,000 long haul truck deliveries per year, not to mention extensive local deliveries. In an effort to reduce diesel emissions and improve air quality, GreenRoots successfully won federal and state funding, matched by private dollars, to carry out projects at NEPC and adjacent businesses to cut emissions significantly. GreenRoots, together with the Board of Health and local businesses, successfully implemented ambitious efforts resulting in an annual reduction of 2,000 tons of harmful pollutants and 400,000 gallons of fuel usage by replacing 113 high sulfur content diesel engines at NEPC, Shapiro Produce and Eastern Minerals Salt Dock; and retrofitting an additional 19 trucks privately and municipally owned. The Produce Center Project ended up saving the facility $500,000 annually. The mountains along the Chelsea Creek actually are road salt piles that provide de-icing needs for upwards of 300+ communities in New England. More than 800,000 tons of salt travels through this salt distribution facility each year. The salt arrives on ships and is distributed throughout the region on thousands of trucks. For years, GreenRoots challenged the salt dock’s operations because it believed the pile was in violation of a state law requiring permanent coverage of snow removal chemicals like this pile. In 2010, the company won an amendment to the law which allowed the Chelsea salt pile to be stored without permanent coverage. 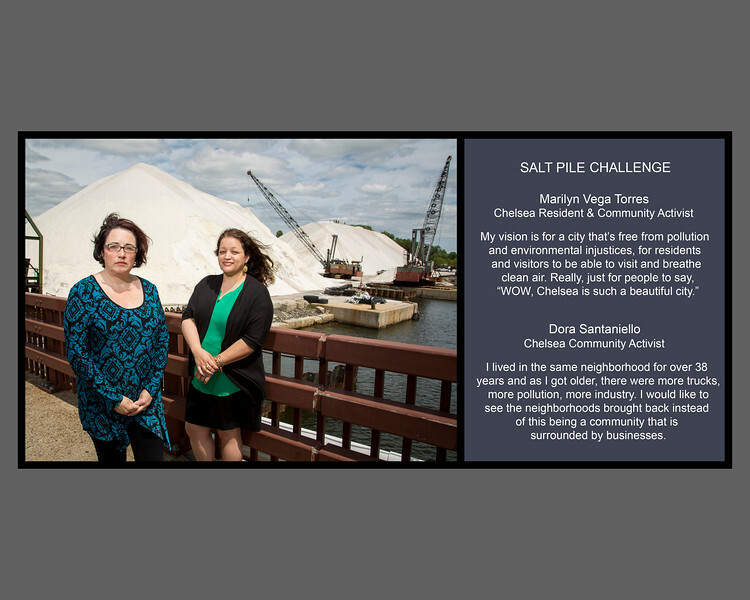 While GreenRoots did not win the fight to have the salt pile covered, it did achieve many accomplishments regarding environmental concerns. The company now covers their salt with tarps throughout the spring and summer months; utilizes best management practices to load and offload salt; utilizes ultra low sulfur diesel that cuts air pollution significantly; signed a community agreement to contribute towards neighborhood improvement projects; redeveloped the former Coastal Oil site into an award winning park along the Chelsea Creek; and developed a working relationship with the company to achieve mutually agreeable goals. 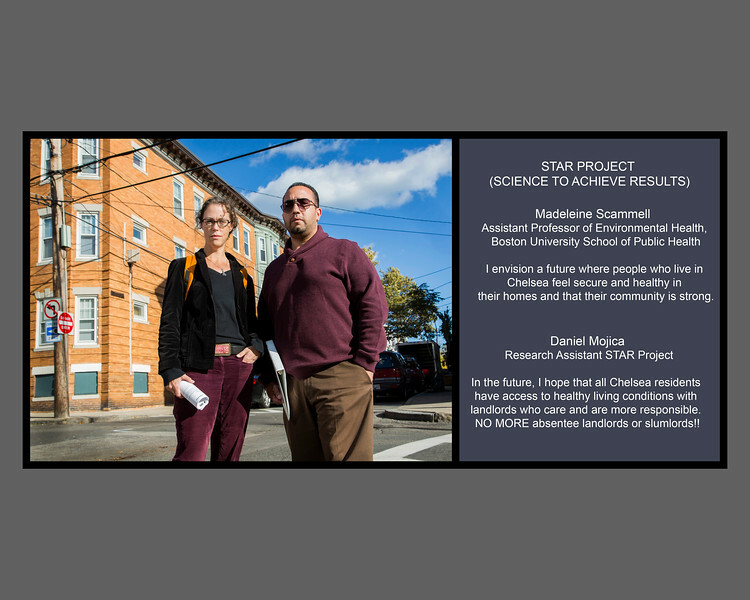 The Chelsea STAR (Science To Achieve Results) study was funded by the US EPA from 2010-2014 and consisted of a partnership between GreenRoots and the Boston University School of Public Health. Through Chelsea STAR, 15 bilingual English-Spanish speaking staff were trained to recruit and interview over 350 Chelsea residents who reflected the demographics of the city in five neighborhoods (see http://www.chelseastar.org for a map). Findings include information on residents' use of parks, fear of violence, sleep disturbance due to noise, neighborhood conditions, and their associations with fair or poor self-rated health and depressive symptoms. Based on the data gathered, a new project is underway to examine indoor and outdoor air quality, and environmental stressors related to housing. STAR data has been used in many venues. One of the most notable is the successful advocacy for improved public lighting that culminated with 1,627 new LED streetlights in neighborhoods across the city in 2013. The Youth Pass Campaign was a 9-year battle for transit justice for our youth. The Environmental Chelsea Organizers (ECO) of GreenRoots joined hundreds of youth across the Greater Boston area in fighting for a reduced-fare pass for all youth. 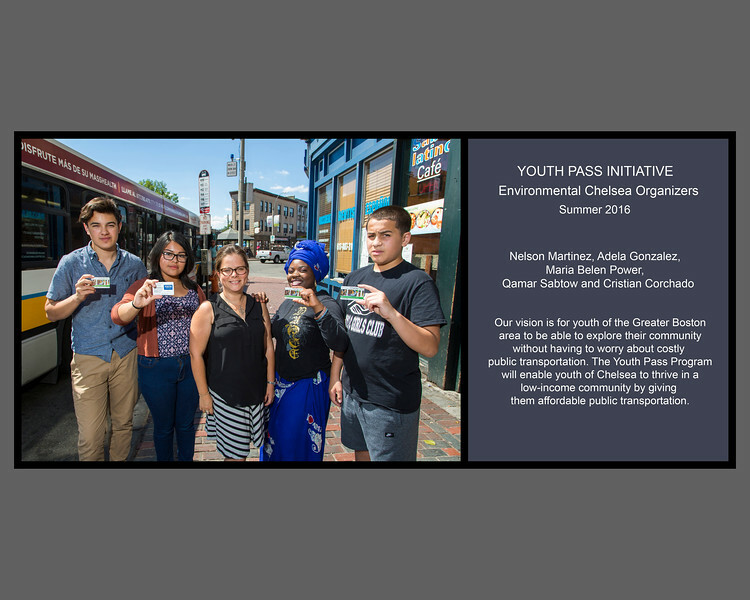 After many years of public actions, written and verbal testimony, lobbying and negotiation, we achieved a year long youth pass pilot program in the cities of Boston, Chelsea, Malden and Somerville. 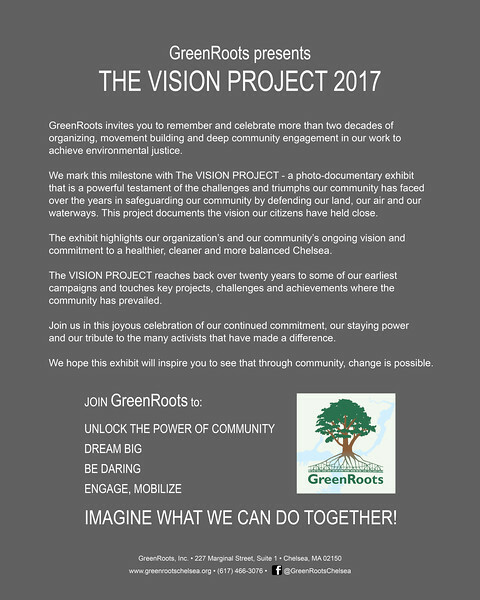 Chelsea was the only city in which a grassroots organization, GreenRoots, not the municipality, managed and implemented the pilot. After a one-year pilot, the program was approved and expanded to cover youth ages 12-25. The permanent implementation began February 1, 2017.